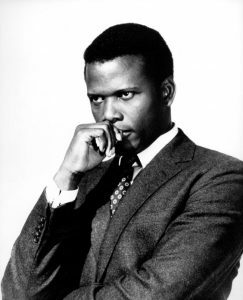 If Sidney Poitier was a wine, 1967 would be his best vintage. He was already a household name and had broken many “firsts,” but in 1967 he starred in three major films and was the top movie star of the year. To Sir, with Love; In the Heat of the Night; and Guess Who’s Coming to Dinner are all classic films in their own right. When you realize this is one year’s work, well, it was clearly an incredible feat. Not bad for an actor who was at first rejected because he couldn’t sing, only learned to read well when he was in his late teens, and worked at erasing his Bahamian accent so he could land acting roles (his parents were from the Bahamas but were visiting in Miami when he was born prematurely). He was on Broadway early and at age 22 was already showing up in films. 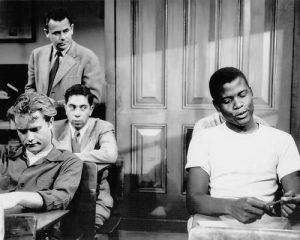 His 1955 appearance in Blackboard Jungle caught people’s attention, and his Academy-nominated performance in The Defiant Ones, with Tony Curtis, put him in the spotlight. 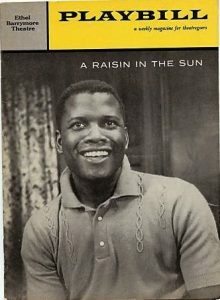 He returned to Broadway to star in the first production of A Raisin in the Sun in 1959 and reprised his role in the 1961 film version. Then he became the first black actor to win the Academy Award for Best Actor in 1963,’s Lilies of the Field. 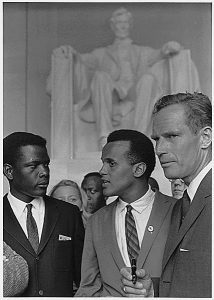 But Poitier was aware that every role he chose would be interpreted through a racial lens, and many of his roles address racial issues head on. 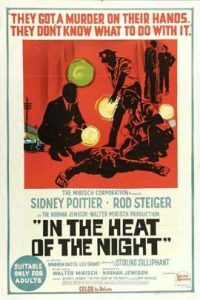 While he received some criticism for being “too acceptable” in Guess Who’s Coming to Dinner, his role in In the Heat of the Night shows him facing down overt racism while struggling with his own sense of self. The film’s simple story exposes the complexity of racism. As always, when we select these films, we struggle over which ones to select. 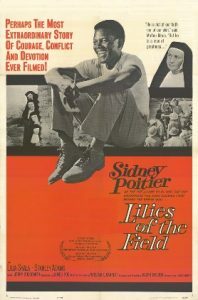 It was a struggle to pass on The Defiant Ones, while it seems like we had to choose Lilies of the Field since he won the Oscar for that performance. 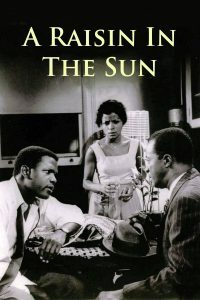 We open with A Raisin in the Sun, Lorraine Hansberry’s incredible play that Poitier starred in both on stage and film. Personally, In the Heat of the Night is one of my all-time favorite films, so I was fighting for that one at the outset. 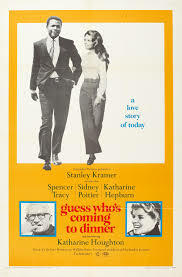 And while it is starting to feel dated, it is hard to pass up Poitier, Hepburn, and Tracy (all Oscar winners) together in Guess Who’s Coming to Dinner. Having conquered the acting world, he became a successful director (Stir Crazy) and continues to receive honors. He was Knighted by Queen Elizabeth II in 1974, and President Obama presented him with the highest civilian award in the U.S., the Presidential Medal of Freedom. Most recently, in 2016, he was awarded a lifetime achievement award by BAFTA (British Academy of Film and Television Arts). We hope you join us as these classics return to the big screen as part of our One Night Only series. All shows begin at 7:30 p.m. and cost just $5.